Broker-dealers need to provide product and technology platforms that meet the diverse needs of financial advisors. Boston, February 11, 2015 – Financial advisors with independent broker-dealers, insurance-affiliated broker-dealers, and large independent networks range from those generating the lion's share of their revenue through investments to those generating most of theirs through insurance, and their product utilization can vary just as widely. Firms operating in this space and their service providers need to realize the diverse ways advisors conduct business in order to better customize their offerings and future developments. 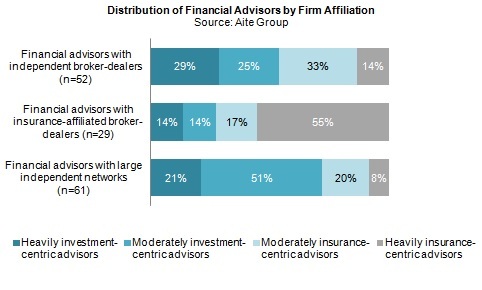 Based on a Q2 2014 online survey among financial advisors across multiple broker-dealer channels, this report compares and contrasts insurance-centric advisors with investment-centric advisors and provides a view into advisors' current and future product usage, revenue generation, fee-based management style, advisor heritage, and propensity to switch channels. This 36-page Impact Report contains 21 figures and two tables. Clients of Aite Group's Wealth Management or Life Insurance services can download this report.